NEW DELHI: The defence ministry is set to invite private sector companies to participate in the Rs 21,000 crore deal for new naval utility helicopters, which will be the first project to kick off under the strategic partnership (SP) policy under the ‘Make in India’ initiative. Sources said that the first ‘Expression of Interest’ (EoI) to the private sector under the policy will be issued for the helicopter deal in the coming days while others like a mega plan to manufacture submarines, main battle tanks and fighter jets will be tackled later, based on how the pilot project goes through. It is learnt that the defence ministry has finalised several financial and technical parameters to shortlist Indian companies that will be considered for the bidding process. Among the criteria is a net worth of at least Rs 800 crore, a minimum revenue of Rs 1,800 crore and a proven capability of delivering mega projects in the past. Companies that would be considered would also need to have some experience of handling defence production contracts in the past three years, with a minimum combined value of Rs 300 crore. Adequate land to set up the helicopter manufacturing plant would also be a criteria. “This will be a test case for the strategic partnership policy, which is a completely new process to select the private sector for major defence projects. A lot on other projects carries on how smoothly this goes and how issues that are bound to come up are tackled,” an official working on the process told ET. As per the process, the defence ministry will shortlist both Indian companies and foreign collaborators in a parallel process. The shortlisted entities will then be asked to submit a joint commercial proposal and the lowest bidder would be declared the winner. In August last year, the Defence Acquisition Council (DAC) approved the procurement of 111 utility helicopters for the Indian Navy at a cost of over Rs 21,000 crore as the first under the SP model. “SP model envisages indigenous manufacturing of major defence platforms by an Indian strategic partner, who will collaborate with foreign OEM, acquire niche technologies and set up production facilities in the country,” the ministry had announced. 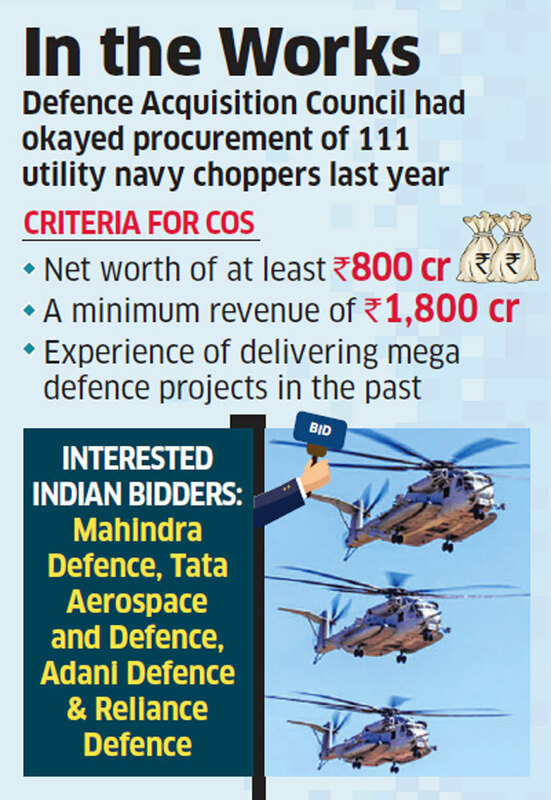 Among the Indian companies that are likely to put in their bids for the project to manufacture 111 choppers are Mahindra Defence, TATA Aerospace and Defence, Adani Defence and Reliance Defence. As a parallel process, foreign companies will also be issued an EoI to be the technical partner for the contract. The companies in the fray are Airbus Helicopters, Sikorsky and Russian Helicopters. The naval utility helicopter contract has seen twists and turns in the past few months as another potential foreign bidder, Bell Helicopters, has made it clear that it is not interested.